Abs like these are achievable by following the right workout regimen. Choosing to trim the belly fat from your midsection is smart, and not just for aesthetic reasons. Belly fat is particularly harmful to the body, increasing your risk of cardiovascular disease, cancer and diabetes. Exercise can help melt away the fat, but going at it without a plan will set you up for failure. Following a straightforward five-step plan of action can help get you on the right track to fitting into your skinny jeans again. Having a plan of action in place is one of the most important steps to losing weight and probably the most overlooked. You have to prepare yourself for daily exercise, including setting aside up to 60 minutes per day to workout. It’s also important to prepare yourself mentally; it’s not an easy process. It will take four to six weeks before you really start seeing results, and this can be mentally and physically draining. Targeting the abdominal muscles is obviously a key part of tightening your midsection. Spend five to 10 minutes per day doing two or three of your favorite ab exercises. 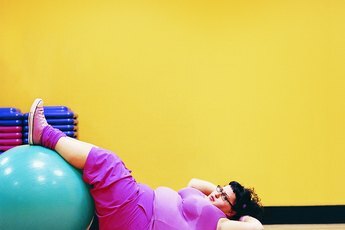 Some of the best abdominal exercises include exercise ball crunches, captain’s chair, bicycle maneuver, vertical leg crunches and reverse crunches. Always use a slow, controlled motion when exercising the abs – going too fast could cause injury and is less effective overall. When it comes to burning fat, cardio is king. Abdominal exercises alone won’t burn belly fat, but cardio exercise will. Spend at least 30 minutes a day, five times per week exercising at a moderate-to-vigorous pace. More exercise is even better for fat burning purposes – try working your way up to 60 minutes per workout. Effective cardio workouts include elliptical training, jogging, walking at a brisk pace, interval training, bicycling and inline skating. Why do a full-body resistance training workout when trying to target belly fat? The fact is that a body with more lean muscle is more efficient at burning calories. So, by increasing your lean body mass, your body will naturally burn more calories, even while you’re at rest. As you know, the more calories you burn, the better your chances are at burning body fat. A simple full-body dumbbell and barbell resistance training workout twice per week is adequate. Cut your cardio workout time down to 10 or 15 minutes on your resistance training workout days. An example of a full-body resistance workout would include deadlifts, bench press, squats, bicep curls, tricep extensions and rows. Eating healthier is the quickest way to eliminate calories, and in turn burn excess belly fat. Focus on whole grains, vegetables, lean proteins, fruit and very few fats and sweets. The easiest way to start a weight loss dieting program is to get a free customized plan from the U.S. Department of Agriculture’s My Plate plan found at ChooseMyPlate.gov. This online tool will show you what to eat, how much of it and provides useful tools to monitor your progress. Can You Get in Shape in 4 Weeks Without a Gym?